Opinion, insight and buzz on gay life in Switzerland and beyond. There are many reasons why Switzerland might just be aliving paradise on earth. Equal gay rights, though the country fares better than many, aren’t yet one of them. With stability taking a spotlight, change often moves at a glacial pace in Switzerland. So there’s ample time to see what others are doing first. Right now, with the French legislation “Le marriage pourtous” (Marriage for Everyone) eyes are on neighboring France. They say a bad neighbor is a misfortune, as much as a good one is a great blessing. With 573 kilometers of French-Swiss border, it’s not surprising that Switzerland (especially the French-speaking part), takes some influence from neighboring France. So hypothetically, advancement on gay marriage so close to home, could open more doors for Switzerland in the not so far future. But what’s being seen around the debate in France isn’t pleasant. Formal legislative debates literally turned into a fistfight and, in a hateful outburst, Philippe Cochet, an ultra-conservative with the UMPpolitical party, associated gay adoption with the killing of children. At the same time opposing demonstrations heated up causing more than 70 people to be stopped on account of violence. Yet, while providing a “shock” factor across mainstream media, what has taken place in France is truly more shameful for the country than it is impactful for the opposition. In Switzerland’s case, perhaps it’s easier to love humanity than it is to love one’s neighbor. Society is already turning the page on gay rights and continues to move forward. While French diplomats may think they are debating a revolutionary issue, gay-globalization is taking place across the developed world. According to ILGA Europe statistics from January 2012, several European nations are already ahead of France on gay marriage and adoption. And although it’s unclear where Mr. Cochet gets his news, so far no children have been reportedly killed. Now for all this opposition. Varrying sources report between 3,000 and upto 45,000 in Paris. Sure the numbers are impressive, and seeing such hate is saddening, but is the protest really that big? With the same city holding a gay pride of 700,000, the opposition is out numbered. Even little Zurich saw a pride of 35,000. The movement for gay rights will not give way to those who think fistfights in a parliament are acceptable. It will not give way to those who think throwing chairs through bar windows is acceptable. In fact, those who participate in such acts and deem them appropriate should probably be evaluated on their ability to raise children. 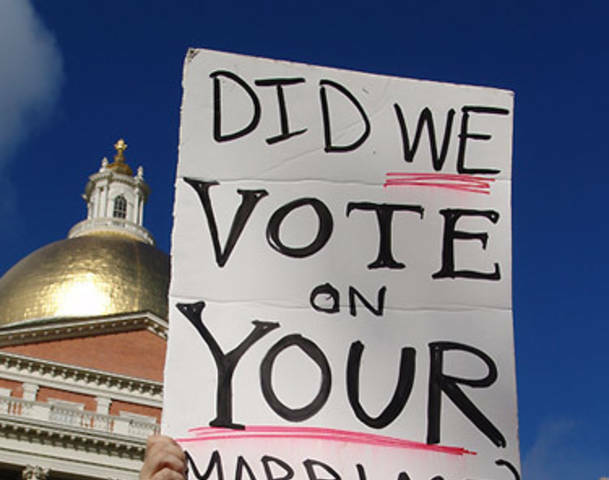 As the opposition makes a fool of itself, the movement to marriage only becomes stronger. Good luck to our friends in France. We are watching for the final vote.